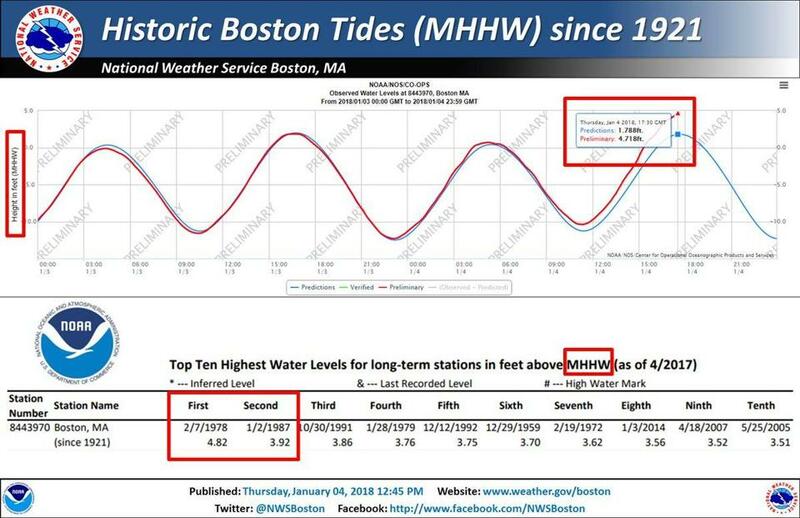 Are these Boston’s highest tides in history? 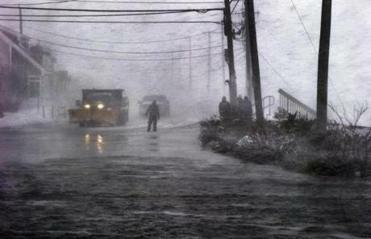 As Thursday’s nor’easter raged on, it quickly became clear that the flooding was the biggest issue, with storm surge battering the Massachusetts coastline. 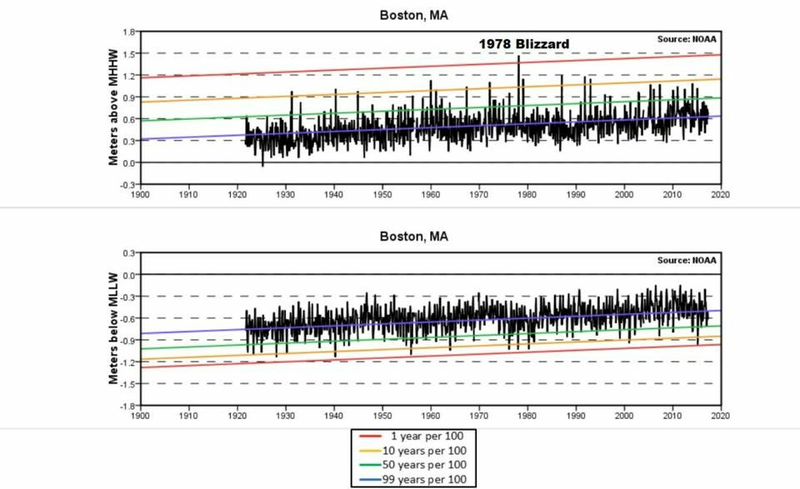 When high tide hit around 12:45 p.m. Thursday, it appeared that Boston Harbor saw its greatest tide swell since at least the Blizzard of 1978 and possibly since 1921. (The NOAA will have to confirm those numbers, but they’re within a few tenths of an inch). This is a remarkable statistic considering all the nor’easters that have happened in the four decades since. 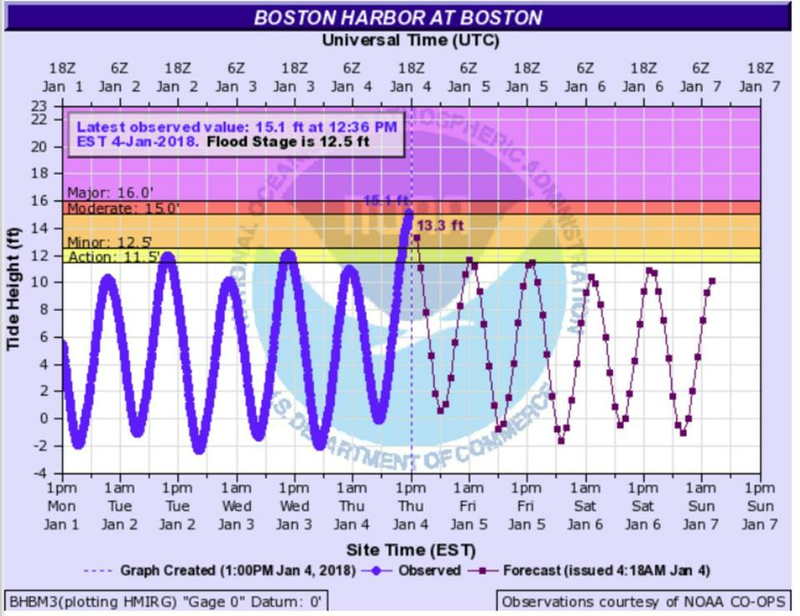 Tide predictions are somewhat difficult and because the storm grew so large, so fast, I suspect that this was underpredicted. This means you can expect to see lots more images of flooded shore roads up and down the coast as many locations continue to experience major flooding. This storm, unlike the blizzard of 1978, is moving rather quickly. That means we’ll be spared from multiple high tides along the coast during the course of the storm. But it’s still a far more significant coastal event than predicted even a few hours ago. The snow too is playing a substantial role in parts of the state, particularly as it rotates westward from the ocean. Heavy snow bands are created as the air rapidly rises in one area. When the air comes back down, you see areas of much lighter snow. That’s why you might see certain pockets that receive a foot or more of snow, while other spots close by might receive much less. At this point, there are areas approaching well over six inches of snow, with those numbers expected to increase throughout the afternoon. On Cape Cod, Thursday morning’s rain is slowly changing to frozen precipitation as the cold air moves south. This will continue Thursday afternoon, creating a flash freeze of sorts in areas that were previously above the freezing point. That will, of course, create an additional hazard. The dynamic nature of the storm also produced so-called thunder snow across the western suburbs of Boston, with snowfall rates of 3 inches per hour. In most places, the storm has reached peak intensity, but Cape Cod and some parts of Southeastern Mass. may still experience high winds Thursday afternoon. I don’t believe the wind gusts will increase dramatically over inland areas for the rest of the afternoon and can be expected to slowly diminish after 5 or 6 p.m. I don’t want to leave the impression that it’s going to become calm. It’s just that the strongest winds should be over by then. Thus far, most of the power outages have been concentrated in Southeastern Mass., Cape Cod and the islands. That should continue to be the case Thursday afternoon, though you can also expect scattered power outages around the rest of the state, as well. Temperatures will fall through the teens and into the single digits overnight, with lowering windchills. Windchill advisories will likely be issued sometime after the storm, and the cold weather will continue through the weekend.